Samaritan's Purse emergency and disaster response team and volunteers worked in Foxboro over weekend, expected in Tweed this week. FOXBORO—Among the most important human rights is the right to help. Volunteers like Mark Yandt, Jim Berry and Tina Storms exercised that right when they knocked on Chris Berry’s door on River Road to offer him some help to clean up his flooded basement. They did so on behalf of Samaritan’s Purse-a charity specializing in disaster relief. 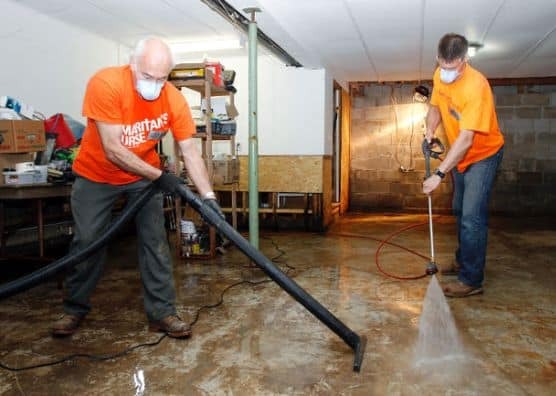 Prior to finishing a complete gutting of Berry’s basement Saturday morning, the trio of volunteers were joined by six other volunteers Thursday and Friday to help remove about 3,500 sandbags from Berry’s property and from his neighbour Derrick Swoffer’s. They were piled up along River Road for city crews to pick up sometime this week. Yandt is no stranger to disaster relief work with Samaritan’s Purse. The Ottawa resident responded to the call for help last year when parts of southern Alberta were affected by flood. He was called in again less than two weeks ago to the Quinte region. Samaritan’s Purse, led by regional representative Stephen Elliott, rolled into Belleville Friday, May 2 when it set up its mobile headquarters at Maranatha Christian Reformed Church on College Street. While at Berry’s residence Yandt and Belleville-based volunteers Jim Berry and Storms filled about two dumpsters with damaged furniture, soaked drywall and flooring. “We’re just finishing off now. We swept, we’re pressure washing everything and vacuuming all that water out and we will be off to Tweed this afternoon,” added the team’s leader. Samaritan’s Purse began relied efforts in Foxboro last Wednesday, conducted damage assessment in the Tweed area in the meantime and is ready to stay in the Quinte area for two more weeks if necessary. As of last Wednesday, Elliott said more than 45 volunteers had answered the charity’s call for assistance. At homes where basements stayed dry, volunteers are mostly busy removing and carrying sandbags, as well as helping with landscaping work. Cleaning up water from basements will take longer. 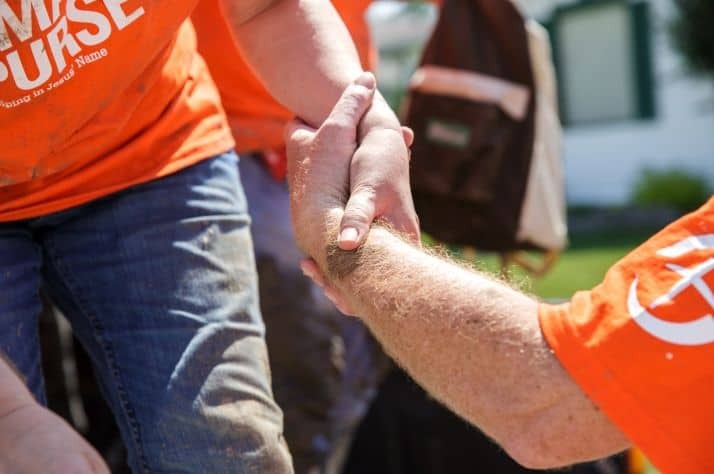 Since 2005, Samaritan’s Purse has mobilized equipment and volunteers to respond to more than 20 disasters across North America, from Southern Alberta to Gulfport, Mississippi where the charity spent nine months assisting the community after Hurricane Katrina. “With the generous assistance of more than 8,400 volunteers, we have been able to help more than 2,400 families recover their homes and properties through our disaster relief efforts,” said Elliott. Though Berry told Samaritan’s Purse volunteers city crews would remove sandbags, Yandt’s team came ahead of time to remove them all before gutting his whole basement. “They are just amazing,” said Berry, whose property sustained about $50,000 in damage, including to landscaping. From drywall, lumber, insulation, a bar, flooring, a 50-inch TV to a freezer, most of what was sitting in Berry’s basement had to be removed and trashed. He bought his River Road property in 2009, the year after Belleville was last hit by such a flood. He said this will not make him move. “No, we’ve gone five years (without flood) the first time. If it happened every year, maybe,” he said. Berry had never heard of Samaritan’s Purse before last week when members of an assessment team knocked on his door. “I had no idea. It’s a great organization. I do know for what they’ve done for me personally, I am eternally grateful,” he said. To register as a volunteer with Samaritan’s Purse or request a home assessment, call the local command centre at 613-210-0792. The line isn’t staffed, but the charity has set up a voice mail. Samaritan’s Purse emergency and disaster response team and volunteers worked in Foxboro over weekend, expected in Tweed this week.